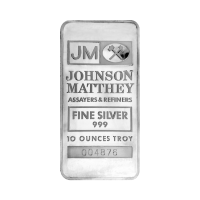 These vintage Johnson Matthey Bars are 999 Fine Silver, and weigh 10 Troy ounces. Each bar has a unique serial number, and these older JM bars are highly sought after. 최상의 기준으로 제작된 이 바들은 귀금속 시장 선도 기업에 대해 기대할만한 수준을 제시합니다. It is thought that only 250 of these bars were ever minted. 10 oz Johnson Matthey TD Bank Vintage Silver Bar These vintage Johnson Matthey Bars are 999 Fine Silver, and weigh 10 Troy ounces. Each bar has a unique serial number, and these older JM bars are highly sought after. 최상의 기준으로 제작된 이 바들은 귀금속 시장 선도 기업에 대해 기대할만한 수준을 제시합니다. It is thought that only 250 of these bars were ever minted. 이 실버 불리언바는 1817년부터 비즈니스를 시작한 정련회사 존슨 매티사에서 주조했습니다. 1817년에 금 시금사인 퍼시벌 노튼 존슨이 설립했으며, 1851년 조지 매티가 사업에 합류해 세계적인 기업으로 발돋움했습니다. 이 회사는 세계 불리언 시장에서 큰 지분을 담당했으며, 나중에는 다양한 종류의 금속 정련 및 주조업으로 사업영역을 확장했습니다. 지난 200여년 가까이 상품의 품질과 평판으로 세계적으로 잘 알려진 존슨 매티는 불리언 딜러와 수집가들에게 사랑을 받아왔습니다.